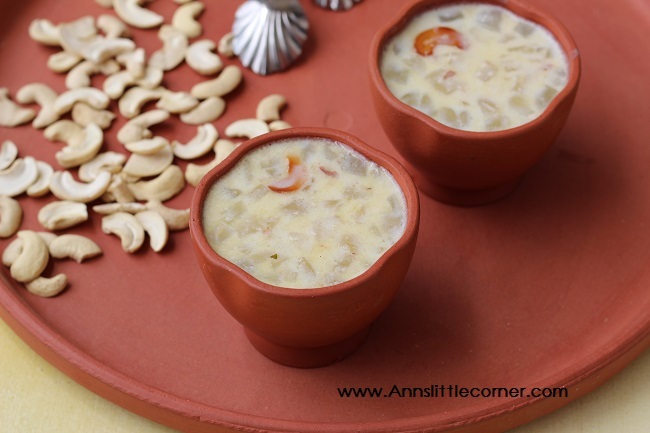 Palm Fruit Kheer / Ice Apple Kheer / Nungu Payasam is one of the delicious desserts that can be enjoyed in summer as these nungu is available in the summer months. 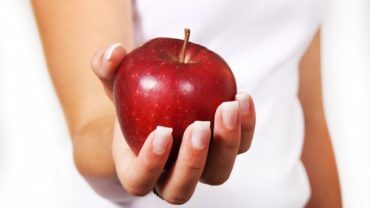 This recipe is easy and prepared in minutes. Full fat milk is simmered with almond paste for few minutes. Cooled down and then the nungu is chopped and added in. This is left for 30 minutes for the flavours to blend well. This dessert tastes best when served chill. Nungu gives a cooling effect to the body plus a super delicious dessert. Checkout other variations of Summer Dessert recipes. 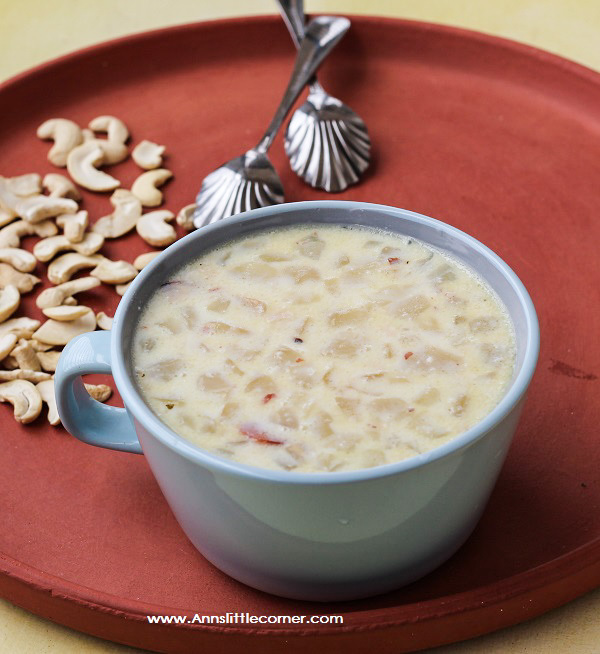 Palm Fruit Kheer / Ice Apple Kheer / Nungu Payasam is one of the delicious kheer. Peel the outer skin of nungu and chop them into smaller pieces. Heat ghee in a wok and roast the cashews. Remove the cashews from the wok. In the same wok, add in the boiled and simmered milk and the almond paste. Add in sugar to taste. Cook for few mins. Switch off the flame. Wait until the milk gets to warm mode from hot mode. Add in the chopped palm fruit chunks and cashews. Allow it to rest atleast for 30 minutes. 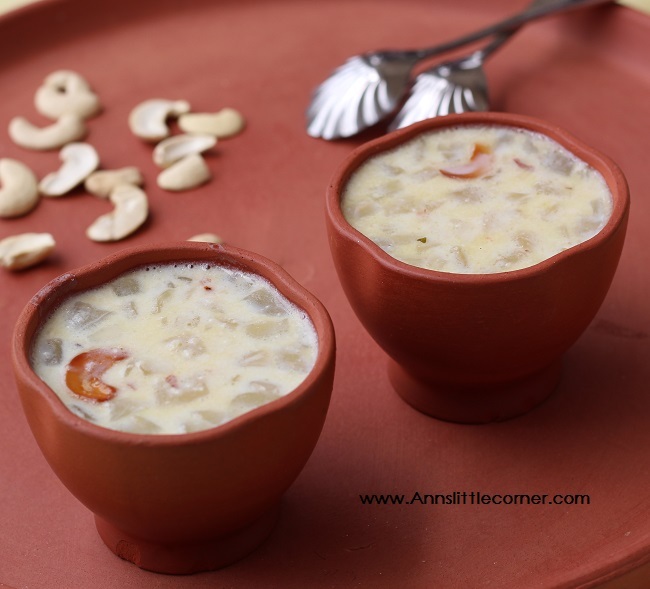 Delicious Palm Fruit Kheer is now ready to serve. Cardamom can be replaced with Rose Water as well. It tastes great. Do not add the palm fruit chunks when the milk is hot or the milk might cuddle. Soak almonds in water for 4 hours and grind them into a paste.